This is one of my favorite recipes this year! 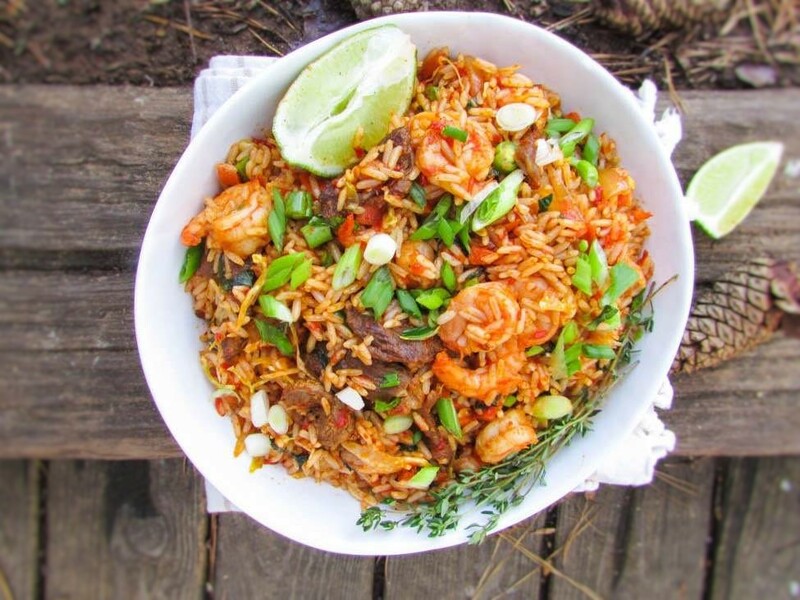 It’s like a redo of my Jollof fried rice recipe; only with the use of Atadindin. The beauty of this recipe is that, you can make it with any spicy Nigerian stew. The beauty also lies in the combination of the spicy stew with basil. Ordinarily, if you have had Efirin/basil stew, you will know the deliciousness that it carries with it. Last Fall, I made a new friend in Remmy. She’s a beautiful Lawyer (@elimavenue on instagram) with a flare for cooking. Not only does she have the most amazing recipes, but she shared this particular one with me. The first time I made this fried rice, I wanted to share the recipe, but I felt like there was something missing. And now? It has been converted to this bowl of deliciousness. When I was younger, my favorite left over was a stir fry made with stew and white rice. We never threw away food; even when food looked like it was going bad, my mother would try to revive it…sigh! Growing up in Nigeria, Sundays were for rice and stew. Even until this day, my mother still calls every Sunday to make sure I make rice and stew for her grand children(my ajebutters). On Sunday afternoons, after lunch, my mother would save the left over stew and on Monday, she would boil some white rice and do a stir fry and adding the stew as the main base. Like I said, for this recipe, I used Atadindin, but you could also use any stew of your choice. This Christmas, I’m going non traditional, but easy. With this recipe, you can see the power of the left over! And no, it’s not concoction, it’s a deliciousness like you have never known before. It reminds me of my childhood, my cousins and how we always waited for the Monday Jollof/ fried rice twist. Days like this reminds me of my father. Christmas with my father was just amazing. Weeks before Christmas day, he used would take us to his tailor to make us Christmas clothes. It was usually with the Nigerian brocade fabric. My siblings and I would wear the same color of brocade, starched to the heavens! In our heads we were running things. It wasn’t until my most older brother started running his own business that my other brothers started wearing suits and me, little princess ball dresses. We were very young children, so Christmas meant a lot to us at the time. One Christmas, my brother bought me a white sequined dress which had a bottom shaped like a balloon. My mother had me get my first perm and by the time I was dressed, I looked like a little African Disney Princess. During the Christmas holidays, we were always busy in our house with preparations. There is not much difference between Christmas in America and Christmas in Nigeria. There is always the part of food shopping, gift shopping and the busy kitchen. And to cut the time for cooking, you now have this amazing recipe that even I cannot get enough of. Season the beef with salt, garlic powder and ¼ tsp oil. Let it marinate for about 10minutes. Heat a wok with ½ tbsp oil. Add the beef and brown. Once brown, remove from the work and set aside. Season the shrimp with black pepper and salt. Add the butter into the same wok used for the beef. Once the butter is melted, add the shrimp and stir fry until pink. Remove and set aside. 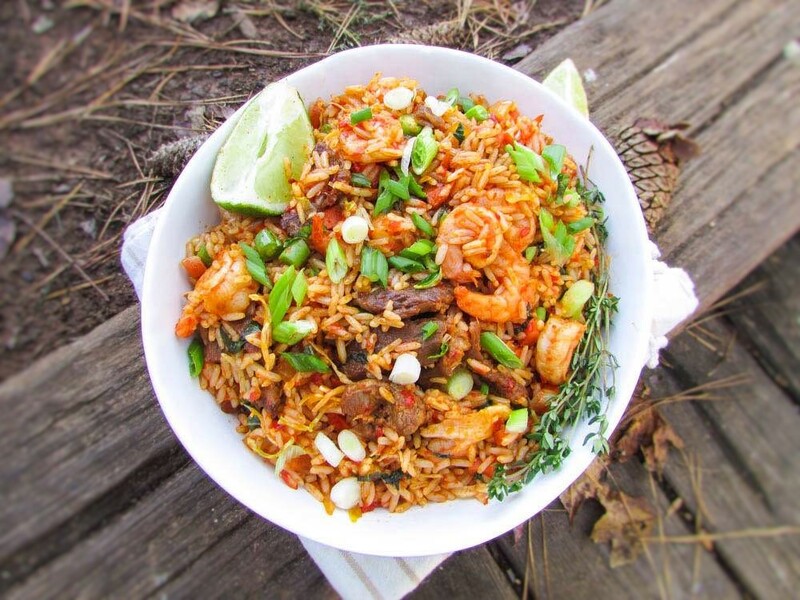 This entry was posted in Carbohydrate, Christmas recipes, Fried Rice, gluten free nigerian recipes, Gluten free recipes, Holiday recipes, Jollof rice, Nigerian Rice Recipe, Nigerian rice recipes, Stir fries, Stir Fries, Stir fry, stir fry recipes, Uncategorized and tagged Atadindin fried rice recipe, Atadindin recipe, jollof fried rice recipe, Nigerian Christmas recipe, Nigerian Fried rice recipe.